Pensacola, Florida, February 12, 2018 – Jerry Pate Company is pleased to announce Michael Jersey, Jerry Pate Company Club Car Account Executive, was awarded the 2017 Superior Salesman of the Year for Fleet Golf. 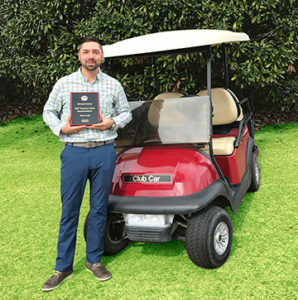 On January 17, during Club Car’s Annual Distributor Sales Meeting, this special distinction was presented to only one Account Executive in the country. In only his second year with Jerry Pate Company, winning this award speaks volumes to his hard work, tenacity and dedication taking care of customers. “We are very proud of Michael and his achievements in a short time with our company. Michael understands what customer care really means and is the key to his success,” said Jerry Pate, Chairman of Jerry Pate Company.